Final Giveaway: FBG Ts and a TRX! Well, it’s the end of our crazy giveaway week in celebration of our b-day, and you know we couldn’t end it quietly. Nope, today is the most valued prize of all, and it’s a four-fer! We’re giving away three new “Junk in the Trunk” FBG tees, and…drum roll please…a TRX HOME TRAINING BUNDLE. Worth the wait, right?! I’ve been quite vocal about my love of the TRX, and now you have the chance to try it, too! 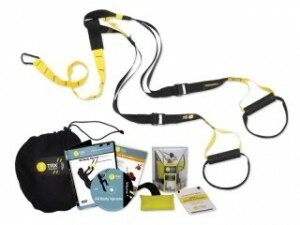 Fitness Anywhere is giving away an entire TRX Home Training Bundle. This baby comes with all you need to get TRXed in your own home, including the suspension trainer, workout DVD, travel bag (perfect for trips! ), easy-to-understand instructions and a laminated workout card that features a killer 12-exercise routine. And if that wasn’t enough, Erin and I are throwing in some FBG swag to three more lucky readers. (It’s only fair since we were so lucky with our generous sponsors.) These “Keeping a lid on the junk in the trunk” tees are super comfy and can be worn casually and during power walks or yoga. We love ’em on a Saturday when we don’t have to do anything but catch up on The Biggest Loser and do a few sit-ups and push-ups during commercials. The three winners will have their choice of the tees in three colors: lavender (pictured right), raspberry or grey. All are pretty!